Click on the images for more photos. At least seven people were killed, including the suspected gunman, in a mass shooting at a Sikh temple in Oak Creek, Wis., south of Milwaukee on Sunday. According to police, 911 dispatchers received multiple calls from the temple at approximately 10:25 a.m. local time. An officer who responded to the scene was treating a victim when he was "ambushed" by the suspected gunman in the parking lot, Oak Creek Police Chief John Edwards said. The veteran officer was shot multiple times and rushed to Milwaukee's Froedtert Hospital where he underwent surgery, Edwards said. The suspect was shot and killed by a second officer, police said. The gunman was not identified, and no motive was released. But according to Thomas Ahern, spokesman for the ATF Chicago bureau, the gunman was a white male in his early 40s. Sources told ABC News the suspect was a "white supremacist" or "skinhead." And officials told NBC News he had "some kind of radical or white supremacist views," but was apparently not a member of any kind of radical organization. His past run-ins with law enforcement were described as minor. Tactical units conducting a sweep of the 17,000-square-foot temple discovered four bodies inside and three—including the gunman—in the parking lot. Edwards said "weapons" were recovered, but would not elaborate. According to CNN, two semi-automatic handguns were recovered at the scene, and member of the temple described the gunman as tall male with what appeared to be a "9/11 tattoo." Officials told NBC the suspect, who served in the U.S. Army, had many tattoos. There were initial, unconfirmed reports of multiple shooters and a hostage situation, though police said they believe there was just one gunman. A spokesman for Froedtert Hospital said a total of three victims, including the officer, were admitted—two with gunshot wounds to the face and one with gunshot wounds to the abdomen. All three are in critical condition, the spokesman said. Other area hospitals were initially told to prepare for as many as 20 victims, though it appears that figure was precautionary. Law enforcement officials are treating the case as an "act of domestic terrorism," police said, and the FBI is leading the investigation. The names of the victims in Sunday's shooting were not released. According to the Milwaukee Journal Sentinel, Satwant Kaleka, the president of the temple, was one of the victims taken to Froedtert Hospital, according to his nephew, Gurmit Kaleka. Dozens of worshipers, including women and children, were gathering for a meal before an 11:30 a.m. prayer service at the temple, or gurdwara, when the shooting occurred. There are about 500 members in the congregation, officials said. Witnesses described a chaotic scene as worshipers reportedly hid inside closets within the building after the gunman opened fire inside. President Barack Obama was notified of the shooting shortly before 1 p.m. (ET) by chief counterterrorism adviser John Brennan, a senior administration official told Yahoo News. "Michelle and I were deeply saddened to learn of the shooting that tragically took so many lives in Wisconsin," Obama said. "At this difficult time, the people of Oak Creek must know that the American people have them in our thoughts and prayers, and our hearts go out to the families and friends of those who were killed and wounded. My administration will provide whatever support is necessary to the officials who are responding to this tragic shooting and moving forward with an investigation. As we mourn this loss which took place at a house of worship, we are reminded how much our country has been enriched by Sikhs, who are a part of our broader American family." Mitt Romney released a statement, too. "This was a senseless act of violence and a tragedy that should never befall any house of worship," Romney said. 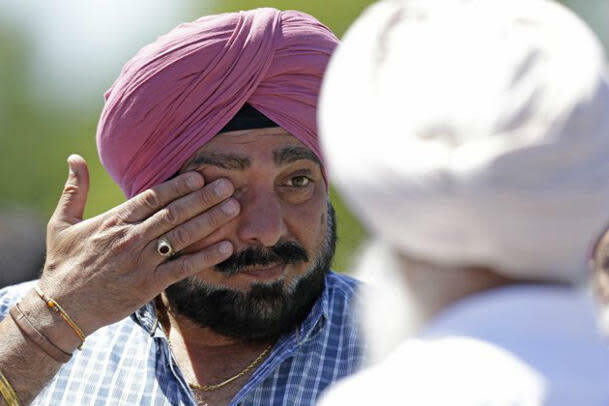 "Our hearts are with the victims, their families, and the entire Oak Creek Sikh community. We join Americans everywhere in mourning those who lost their lives and in prayer for healing in the difficult days ahead." Wis. Gov. Scott Walker said his office is working with the FBI and local law enforcement in its investigation. "Our hearts go out to the victims and their families as we all struggle to comprehend the evil that begets this terrible violence," Walker said. "At the same time, we are filled with gratitude for our first responders, who show bravery and selflessness as they put aside their own safety to protect our neighbors and friends." The Indian Embassy in Washington called it a "tragic incident" and said it has been in touch with the National Security Council and local authorities to monitor the situation. Sunday's shooting comes less than a month after the Aurora, Colo., theater massacre, when 12 people were killed and 58 wounded during a midnight screening of "Dark Knight Rises." Sikhism is a 500-year-old monotheist faith with about 27 million followers worldwide, including about 300,000 in the United States. Since 9/11, Sikh groups in the United States have reported a rise in bias attacks. There have been more than 700 reports of hate-related incidents against Sikhs since the Sept. 11, 2001, terror attacks, according to the Associated Press. "Sikhs don't practice the same religion as Muslims," the AP noted, "but their long beards and turbans often cause them to be mistaken for Muslims, advocates say." In the wake of the shooting in Wisconsin, law enforcement officials in other cities, including New York City, increased patrols near Sikh temples on Sunday. However, there is no known threat against Sikh temples in New York, the NYPD said.